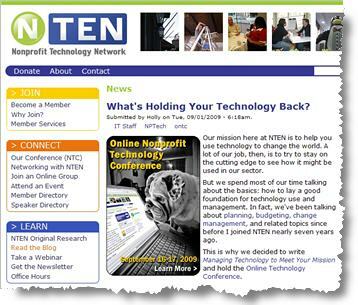 NTEN (The Nonprofit Technology Network) is offering a chance to win free admission to the Online Nonprofit Technology Conference, September 16 and 17, 2009. It's not only a great chance for some lucky non-profit folks to get free professional development, but there's a quick lesson in online marketing that you might be able to use in your own organization. This 2-day online event is geared towards the “tech responsible” individuals within any nonprofit organization — IT staff, Executive Directors, CIOs, CTOs, and others in charge of technology. Content will cover what Tech and IT Leaders need to know to hone their skills and understanding, to make better informed technology decisions. For a chance to win a free registration, just share your greatest challenge in managing technology in your organization in the comments at What’s Holding Your Technology Back? on the NTEN blog. On Tuesday, September 8th, two of the commenters will be picked to win free registrations to the ONTC — and every “serious commenter” will get 25% off the regular registration price ($250 for NTEN members / $350 for nonmembers). Drawing attention to NTEN and its programs in general, the first step in attracting new members. And this is key: It’s a fair trade. The online conference, the contest, and the organization itself all offer real value to members and prospective members alike. Plus, non-profit folks get to air their frustrations, challenges and questions about technology use in their organizations — to enter the conversation as well as the contest. Could your organization do the same kind of thing? Polls and surveys are a great start to learn more about your members and supporters, but if you can add a contest or free bonus for participation, it ups the response rate. Not only that, but contests have a way of going viral — increasing the online exposure for your organization through the power of social media. Meanwhile, you’re gaining a lot of valuable, first-hand, concrete and actionable information, to help you improve the programs and services that your non-profit delivers and reach out to more potential supporters. Has your non-profit or association ever run a contest as a way to learn more about the challenges facing your members and constituents? Tell us about it in the comments!